I work from home in India, and though I work with global brands on exciting projects, it’s pretty lonely for me at work. Sure I share my office with my rambunctious toddler, whose life’s mission is to keep things interesting for me. But I always felt this need to be with peers and like-minded individuals. I mean, how much more can I torture my husband discussing digital marketing strategies, pouting when Google updates its algorithms, or sulking about difficult clients! My need to be able to “talk” to other people who could empathize (maybe even sympathize) with me drove me to join Twitter chats. I found a great set of people who were experts in their respective niches, and I was amazed. I was learning so much from those Twitter chats, namely those by Buffer, SEMrush, Express Writers, and more. And I was meeting new people every day. Fast forward a few months and suddenly I stumbled on the news that #BufferChat was retiring. By that time, I was a Buffer Pro user and, as I had been a big Buffer fan for years, I was quite crushed with this bit of news. I was learning so much from this particular Twitter chat, and I had made some really good friends within that community, so Wednesday nights without #Bufferchat was not something I was willing to live with. So I started looking at options regarding what I could do next to fill that void. And that’s when it struck me — I could be more active on the Buffer Community on Slack instead. What is the Buffer Community on Slack? As a Pro user, I had already joined the Buffer Community on Slack, but I wasn’t really active. I was more comfortable messaging other community members privately, rather than participating in any ongoing discussion. As I started to think more about it, I realized one big advantage of getting involved with the Buffer Community on Slack — I didn’t have to worry about staying up late or waking up really early to participate in real time, like I had done in the past with #BufferChat and other Twitter chats. Then this whole idea became even more attractive when I read Arielle’s post about the upcoming Community Host cohort — she’s the Community Strategist on the Buffer team who runs the Slack community. And she was accepting applications to be a Community Host for the Buffer Community on Slack. So what exactly is a Buffer Community Host? Well, they are these really active and committed individuals who want to do “more” for the Buffer Community on Slack. They actively engage the other members, offer support and advice when needed, welcome new members to the community, host a weekly chat called Mastermind, and so on. They are aspiring leaders and this Community Hosts leadership program in such a global community gives them a taste of community building. As I read Arielle’s post and further researched about Buffer Community Hosts, I realized being a Buffer Community Host on Slack was even better for me than participating in Twitter chats or trying to be active on Slack. I mean, sure, I could be active on the Slack channel for the Buffer community as and when I wanted, but if I applied AND if I was chosen to be a Community Host, I would HAVE TO BE active. I would HAVE to speak up and participate in the ongoing discussions, that is, when I have something relevant to share, of course. And that fact that being a Community Host would MAKE me be more active online and engage with more people, and get me a whole new bunch of friends while learning and growing within this industry, compelled me to apply for the position. There are no words to express my surprise (almost shock!) when I heard back from Arielle asking me if I was still interested to become a Community Host. 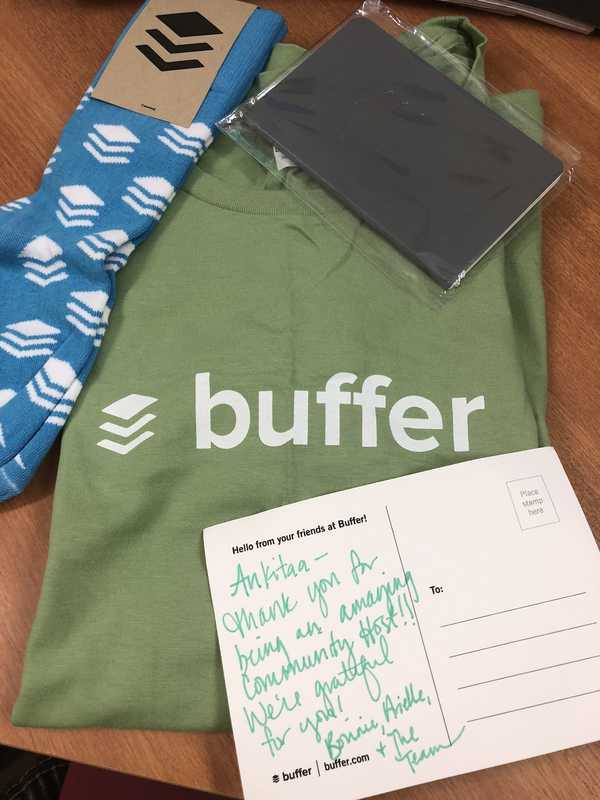 I became a part of the Buffer Community Hosts Cohort #4 back in August 2018 and it’s been awesome. The community members are super helpful and engage regularly. And we are so much more than simply social media and digital marketing (though we do that too). There are channels to discuss weekly goals, wellness, books & reading habits, even gratitude, to name a few. There’s a complete separate channel to meet someone new, if you are so inclined. There is also a channel called #jobs to look for work opportunities. I hosted my first Mastermind (a weekly facilitated discussion in the community — the biggest event of the week in the Buffer Community) in the first week of November 2018, and when I started the session, I was so nervous. I took over an hour to prep. I banned my husband and daughter to even talk to me during prep and session time. And if it wasn’t for Arielle and her support, I would have been a complete wreck. But it went well, and I met these amazing women entrepreneurs who were talking about digital marketing strategies I haven’t even heard of! And that’s the power of being in the Buffer Community on Slack. You are learning and growing your knowledge every moment you are on it. The experiences I am having on the Buffer Community on Slack make me feel “full”, like that feeling when you are happy from the inside. I get to work on my own terms, play with my daughter, live my life, while, at the same time, I interact with amazing peeps (who are so generous with their words and learning), get glimpses of work habits from around the world, discover new trends in the industry, and basically learn so much every day. And I am a part of this amazing group of community members who support each other so wholeheartedly. I feel less nervous each day as I interact with more members online in my role as a Buffer Community Host. I mean, a few weeks back, I was really nervous about hosting that Mastermind session on our #social-media-strategy channel, but earlier this week I actually volunteered to host another Mastermind this week. That’s quite the way to hit the KPI I had set for myself in this valiant venture of mine, isn’t it? Life feels good, and that’s why I joined the Buffer Community on Slack. If you’re interested in joining in and meeting other wonderful Buffer users and social media marketers from around the world, head over to www.buffer.com/slack and fill out the quick form! About Ankitaa: She is a digital marketer, writer, trainer and branding consultant at AnksImage.com. Her mission is to help brands deliver high-quality frictionless customer experiences, in order to win at business in a digital world. Note: This article was published by Ankitaa for the Buffer Publication on Medium in November 29, 2018. You can follow Ankitaa’s Medium here.